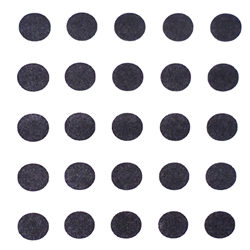 The Howard Disc counting reticle has 25 dots evenly spread across it in a 5 x 5 pattern. This reticle is most commonly used in food processing (most often for tomato based products such as paste, sauce or juice). The Howard counting reticle is made up of 1.382mm diameter dots. When the specimen is viewed with the 10x objective, a count of mold fibers is taken for each circle. If the number exceeds recommended amounts set by USDA, the sample will be checked again using the 20x objective. You can purchase the Howard Disc Counting Reticle here.